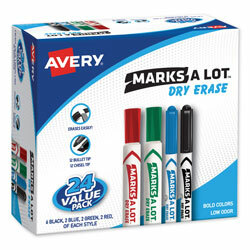 Dry-erase markers work well on whiteboards, glass and other nonporous surfaces. Low-odor, nontoxic ink wipes off easily with a dry cloth or eraser. Durable 3/16" chisel tip writes in three line widths. Dry-erase markers are great for laminated planners and calendars. Nontoxic markers are ACMI certified to meet federal standards. Assorted Dry-Erase Markers from Avery! 174 In Stock today.